When it comes to professional services marketing today, most CEOs understand that it is essential to demonstrate their teams’ expertise and increase the visibility of their firms. But what many don’t realize is that search engine optimization (SEO) is an essential component of this process. Does that seem counterintuitive? Let’s take a closer look. Here’s what every CEO should know about SEO. 1) SEO isn’t what it used to be. Contrary to some people’s beliefs, SEO isn’t a single technique. It’s a set of tools and strategies for helping your audience find your online presence via search engines, particularly Google. And this is why SEO is so important. No matter how well-crafted your website is, no matter how vibrant your content and efficient your lead-generation strategy, none of it will be effective if folks don’t find you in the first place. SEO isn’t a bit of magic that you sprinkle on your site after you’ve built it. Today, it’s a body of practices that impact every stage of your online marketing. It is not about tricking the search engine. It is about doing marketing the right way. Genuinely useful content, organized, indexed and promoted appropriately is the basis of a good ranking. No tricks, no shortcuts. 2) SEO will help buyers find your firm for what you do. Our research on how buyers check out new firms shows that your online presence is the number one way purchasers learn more about you today. Some people may be looking for you by name, having heard of your firm through colleagues. Most people know that SEO will help buyers find you this way. 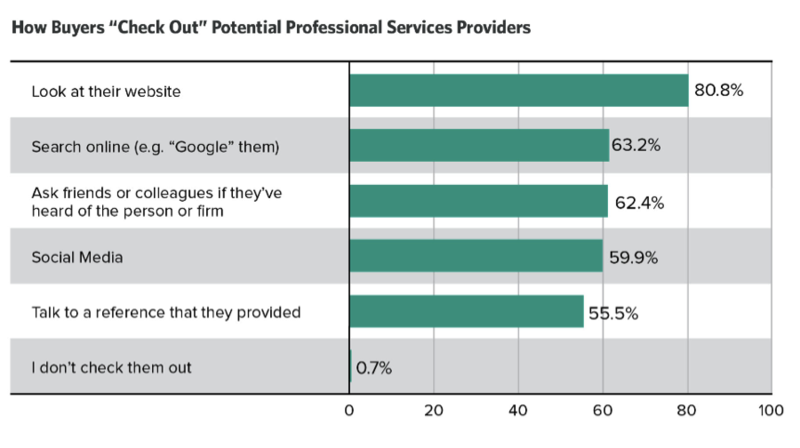 But other searchers may simply be looking for the kinds of solutions you provide – these are the over 63% who search online to check out providers. With a modern SEO strategy, you can be found for your firm’s specialty, the work you do, and the issues you provide solutions to. 3) SEO will help your firm avoid being ruled out. Our research shows that over 50% of firms have ruled out buyers before speaking to them. The top reason? They couldn’t understand how the service provider could help their firms. As we saw in Figure 1, above, search engines are one of the top ways buyers check you out. If you use your SEO-optimized website to clearly explain how your services can help buyers, this gives you a major advantage and helps you avoid being ruled out before you get a foot in the door. 4) Onsite SEO is critical. Onsite SEO encompasses code and strategies that you can implement directly on your own website to increase its ranking in search engine results. Among the most important of these is the incorporation of “keyword phrases” into your site copy and metadata – information in your site’s code that is visible to search engines but not to casual visitors, describing your site and the topics each page covers. Keyword phrases are one of the most important concepts in SEO – these are the phrases that searchers use when they are looking for something online. When those phrases show up in the headlines, copy, and metadata of your content, and if your content is genuinely useful, it will improve your ranking in the user’s search. Another key to onsite SEO is simply following web design best practices. If your site navigation is structured in an orderly, logical way, and if your site loads quickly, this will help Google and other search engines index the site and return it in results more successfully. In April 2015, Google updated their search algorithm to include mobile-friendliness as a factor in search rankings. It’s not hard to see why – more and more people are accessing the internet through phones and tablets, and Google wants to ensure that these users don’t get search results with cramped, hard-to-read designs. If your site renders in an intuitive, accessible way for users on mobile devices, using responsive design or another strategy, this will help your site rank more highly. A quick way to see if your site meets Google’s mobile-friendliness requirements is to run the company’s Mobile-Friendly Test. 6) You must earn your links the right way. To be as effective as possible, your SEO techniques should extend beyond your own site. Your site’s ranking in search is determined in large part by indicators from around the web. Above, I mentioned that if your content is genuinely useful, it will improve the content’s ranking. But how does Google know whether your site is relevant, rather than just a listing of keyword phrases? In part, Google’s algorithm looks at metrics like how long people spend on your site. But it also looks for external validation – links to your content from outside sites, for example. One of the simplest and most organic forms of offsite SEO is sometimes called “link earning.” It short, it means creating and sharing (via social media, email, and other platforms) truly exceptional content. If you get this content in front of the right readers, and it is genuinely relevant to them, they will share it online and boost the content’s visibility in search. 7) Education must be at the heart of your SEO strategy. Another way to encourage links and traffic to your site is by providing useful, educational guest posts on outside blogs – particularly highly-respected and widely-read industry publications. Often, you will have the opportunity to link back to your own site when you contribute your expertise to these blogs, and these links from prestigious domains are extremely beneficial to your search ranking. It’s worth noting, here, just how much SEO has changed in its relatively short lifetime. Not so long ago, companies bought links on basically unread websites – and crammed both their reader-facing copy and their site metadata with as many keywords as they could come up with. But these strategies didn’t give searchers better content, so Google put a stop to them by updating their algorithms and penalizing those techniques. It’s clear, today, that for firms that wish for their site to be seen, the key is and will remain genuinely useful content. Poor or old-fashioned SEO practices can actively damage your visibility. As a CEO you should ensure that your firm isn’t using them. Relevance, usefulness, and education must be your watchwords. By ensuring that these qualities guide your content, both on your own site and in guest publications, you will give your website the best chance to succeed. 8) Social media powers SEO. We’ve discussed the importance of external validation through links from other sites – particularly those with lots of traffic and a strong reputation. Social media is another crucial ingredient in demonstrating the usefulness of your content. As you create content, share it on social media platforms like LinkedIn, Twitter, Facebook, and Google+ and encourage conversation around your insights. As more people share and discuss your content, your site will receive more and more SEO benefit. 9) Your SEO strategy should reflect your firm’s overall strategy. SEO isn’t something you do at the end of your website process. Instead, it should reflect your overall strategy. In fact, it’s key for managing the visibility and even the direction of your firm. Consider this — there are a wide range of tools available to help you conduct keyword research, finding what people in your marketplace are searching for. These tools can also help you track traffic to your site, so you can understand which topics (or areas of need) attract and engage buyers most. This knowledge can be critical for more than making your site more visible online. By using SEO techniques in conjunction with website analytics, you can better understand trends in your marketplace and adapt your business to the demands of the future. As professional services marketing continues its transformation into a deep and rigorous science, SEO is an essential tool you cannot afford to ignore.